Andy Everson reawakens traditional Indigenous art forms through iconic pop culture references. Since his youth, Andy Everson has tried to follow in the footsteps of his Kwakwa̱ka̱'wakw relatives. His work creates bold and unique artistic representations that remain rooted in the age-old traditions of his ancestors. 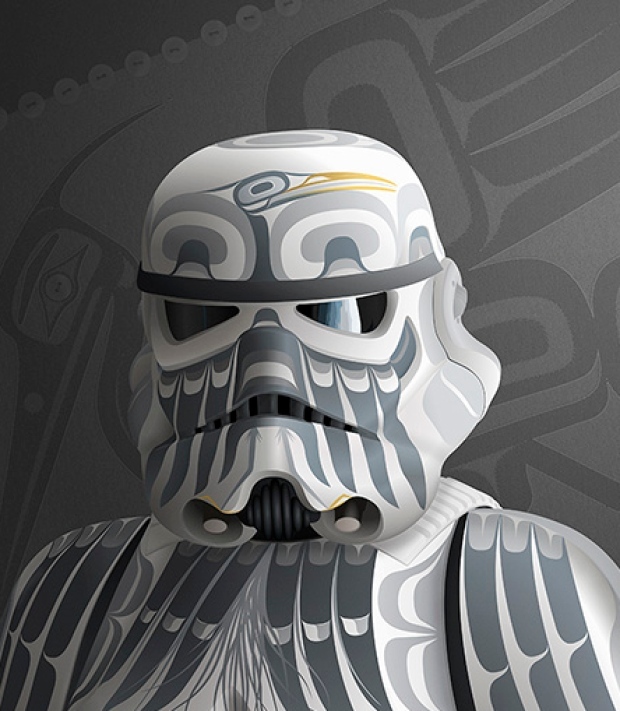 Andy’s pieces explore and express his ancestral artwork in a number of contemporary ways, the most prominent being his fascinating style of juxtaposing Star Wars visual pop culture with Northwest Coast Indigenous art aesthetics. Andy’s provocative Indigenous interpretations of iconic Star Wars characters has allowed him to fuse these two personal passions in fascinating ways. His love of the Star Wars series collides beautifully with his obligation as an Indigenous artist, in ways he feels brings new life to these traditional forms of art. 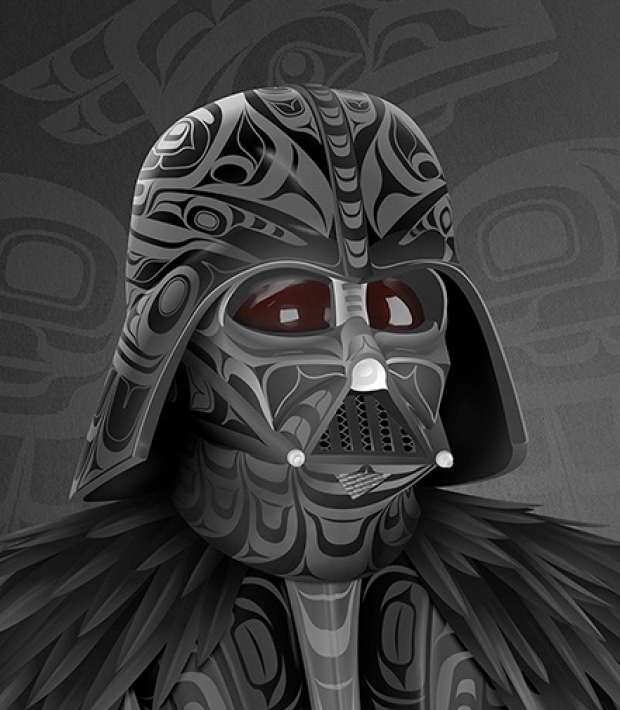 These contemporary interpretations of pop culture references also have significant political undercurrents, as is seen in the unlikely juxtaposition of Darth Vader, a distinctively imperialist figure, with Indigenous aesthetics. 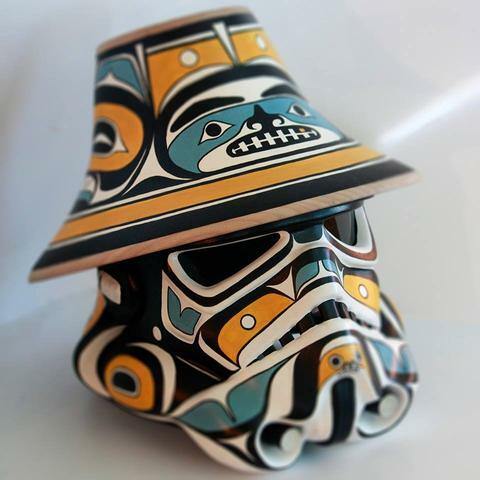 His work also plays off of both Star Wars themes and Indigenous legend, as is seen in his provocative piece “Northern Warrior”, in which Andy presents a stunning interpretation of a Stormtrooper helmet, whose design features traditional Chilkat weaving colors of yellow, blue, black and white, and that is fashioned with a maple wood hat worn by Andy’s ancestors. This piece, along with his other work, is rich with cultural meaning, and creates a compellingly symbolic and iconic aesthetic that is hard to look away from.